When it all starts out and you’re holding your tiny new baby in your arms, you think you have all the time in the world. All the time in the world to teach her to sing and to read, to meander down the trail and name the wildflowers and the birds, to discover opera together, to watch the grass grow. And, yes, it all goes by in a rush and suddenly the tiny baby is nearly thirteen and is accomplished and funny and smart and writes a better sentence than you can and sings arias and makes movies with her friends and swims like a dolphin and bakes brownies and reads whole books in a day and makes you laugh and cry all within an hour. But the work isn’t done. Because you know something you didn’t do, you loving, goofy parents? You didn’t teach her to ride a bike. We should have our parenting licenses revoked. We, who grew up on our bikes, navigating the small town and suburban streets as our highways on sunny spring days and late into dusky summer evenings. We, who called our bikes our horses and raced against our friends. We, who rode out the miles to meet friends at school yards and playgrounds and parks. We, who knew the power and freedom that our own pair of spoked wheels provided. We didn’t teach her to ride a bike. It’s not entirely our fault. We tried. We did get her a wee bike with training wheels. And a wee helmet. And a wee alligator horn for the wee handlebars. And we taught her to pedal that wee bike on our deck and she did it and it was grand. So there. We tried. Sort of. But we live in the country, off a short, sloped, gravel driveway, that empties onto a road marked with a post speed limit of 40 mph but where people rarely whiz by going slower than 45. There’s no way she could practice riding her bike on her own. It would take us loading the bikes onto the car and driving somewhere miles away. It would take intention. And there were so many other things to do and she didn’t seem anxious to learn to ride and, of course, there was plenty of time. We got her a new bike last year two years ago. No more training wheels. We took her to a nearby park with sloping roads that would help her get started. She sort of got it. She rode, but without the confidence you get from riding your bike daily when you’re seven years old and you learn how to take corners no-handed because you’ve got a Slush Puppie in one hand and are waving to a friend with the other. 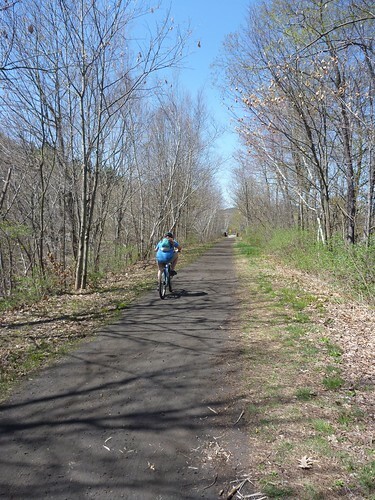 Which is how we arrived at this beautiful spring break week, me and H, our bikes, and her desire to ride the nearby Rail Trail. When we arrived at the trail head, I optimistically put her bike next to an island in the parking lot, one with a high curb so she could rest her right foot there and give a good push off and told her to give it a try. She pushed off, lifted her foot from the curb to the pedal, wobbled, put her foot back down on the curb. I encouraged her to try again, and she did and she did, and I felt small and bad. How had I put her in this position? Shouldn’t I have taught her this years ago? Then the very bad thought came to me: What else haven’t we taught her? I pushed that thought out quickly. No time for that. We talked about different methods for starting off. I showed her how I did it. She tried. She really really tried. She just didn’t trust herself. Putting one foot on the pedal was one thing. Lifting the other from the safe ground to balance on two wheels was quite another. She seemed to trust me that it was possible, but she was scared, and I was angry at myself, and frustrated for her sake. How had I put her in this position? Okay, push the “bad mom” thoughts aside. We can do this. I showed her how I put my left pedal up about 3/4 of the way, put my right foot on the ground, then pushed hard with the left foot onto the pedal to get some speed, then swung my right foot up onto the other pedal. She did that, but didn’t trust it, and put her right foot back down. Okay, I didn’t want to do this, but how about I push her a little bit, just enough to get her rolling? Now she’s rolling, steering a bit unsteadily, but balancing. Then she puts a foot down and stops. I get off my bike, steady her, and push off again. She can ride. She just doesn’t trust it. And she can’t start herself off. I imagine biking the whole trail with my having to get off the bike every time she stops so that I can give her a push. She tries again, and she does it! She’s up and rolling under her own power. It only lasts a little while before she feels unsteady and stops again. But the beautiful part is that she starts again. And again. And again. Without my help. We make intermittent but steady progress down the trail. Sometimes the sloping sides of the trail scare her; she’s afraid she might steer right off and end up in a ditch. I try to reassure her, tell her to just look way down the path and “steer into the future”, which makes her laugh. Which makes me laugh. Hey! How about that? We’re biking. And we’re laughing. Soon, the stops are getting further and further apart. We bike down the trail. I follow her. She aims for that black box, which is actually a little shed off the side of the trail, just past the bridge where we stop for a snack and water. She takes out her iPod, which she’s carried in a tiny backpack, and listens to a song while I watch the water flow under the bridge we’re sitting on. We wave to the joggers and the bikers and dog walkers who pass us while we sit in the sunlight. She gets on her bike, and starts off before I even get rolling. There’s no wobbling now. She’s got it. On our way back to the trail head, we pass a mother and her kids, biking in the opposite direction. One of the kids, who looks to be about eight or nine, is having a hard time. Unsteady, stopping suddenly to put a foot down. The mother is encouraging her, with the same big smile and worried eyes that I was wearing an hour earlier. The kid tries again and gets a decent wobbly roll going. A most beautiful post again…and really, I think you did it right. Much better than my method, which was trying to teach Evan how to ride while wearing Rollerblades. Yes, it went terribly wrong.